Creating Wonderful Spaces: Mile High Beach! 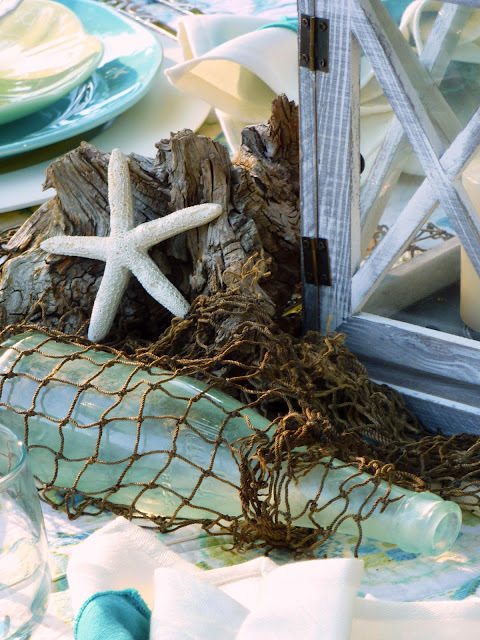 I knew a beach-themed tablescape would challenge me. Beach related items can be found in Colorado, but I had a budget in mind, since I will not have many uses for them. I found some items on clearance, but who wants a seagull on a stick with a broken beak? I made some signs to prove my point! I went to Michael's and bought a bag of shells, some starfish, a net, and a bag of crushed shells. Time to get crafty! I found these extra large wooden chargers on eBay. I painted them ivory (they were green). I asked Mr. Wonderful to drill holes in some of the shells, and then added pearls in between the shells to create my own napkin rings. I found a box of these blue mason jars in our basement. I tied shells on the outside, poured crushed shells inside, and added a candle. This gnarled piece of wood was in my garden. It's as close as I could get to driftwood. 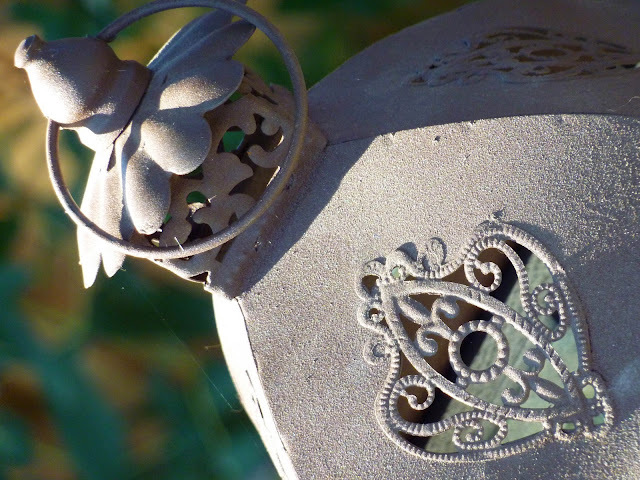 On another trip to Michael's, I found these little votive holders in the colors I was using. 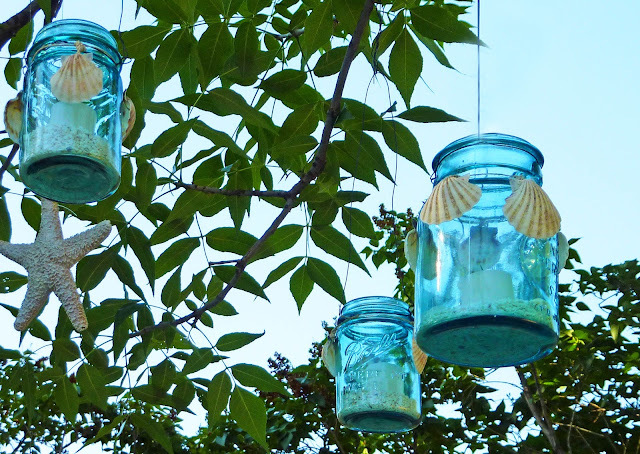 I painted the starfish and strung them up with the jars. 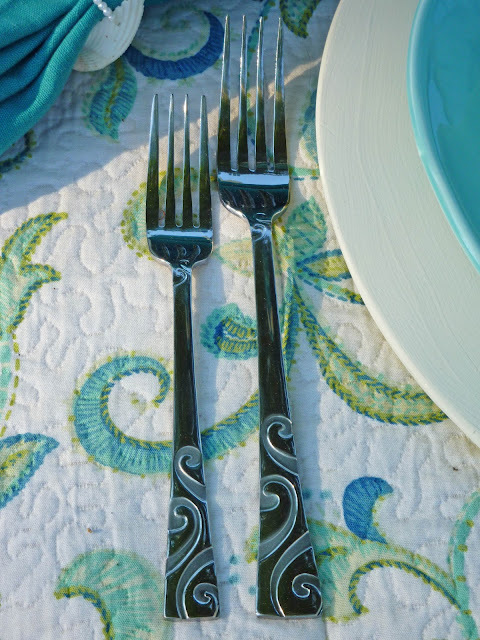 The flatware was chosen because the design mimics the one in the quilt I used as a tablecloth. I found this old bottle when I was looking for the mason jars! The sun is starting to set! 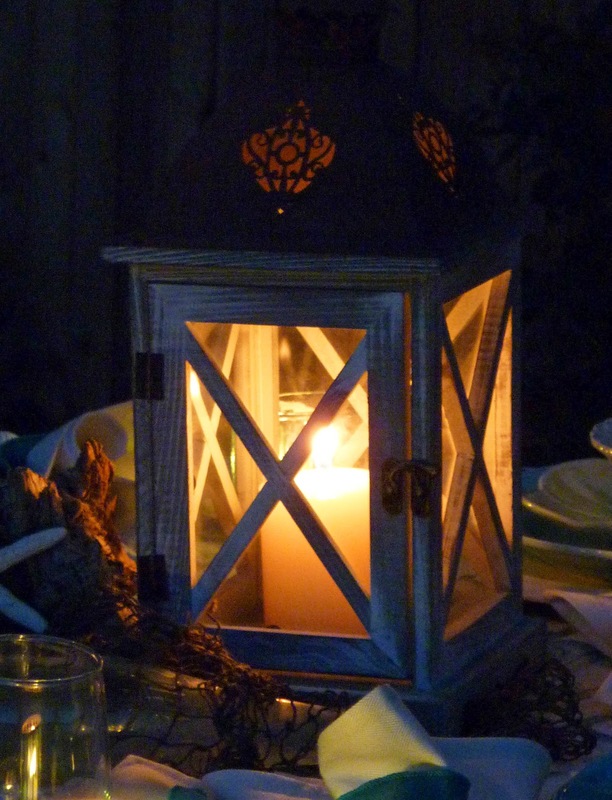 This lantern came with a battery operated candle inside, but I replaced it with the real thing. Be sure to check out the beach-themed tablescapes this week at the CuisineKathleen's Let's Dish Blog Party! 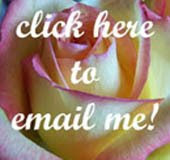 Be sure to visit my sister's blog (you know, the one she writes from Florida!) for her beach table. I am stunned by how pretty this tablescape is! I love the colors!! 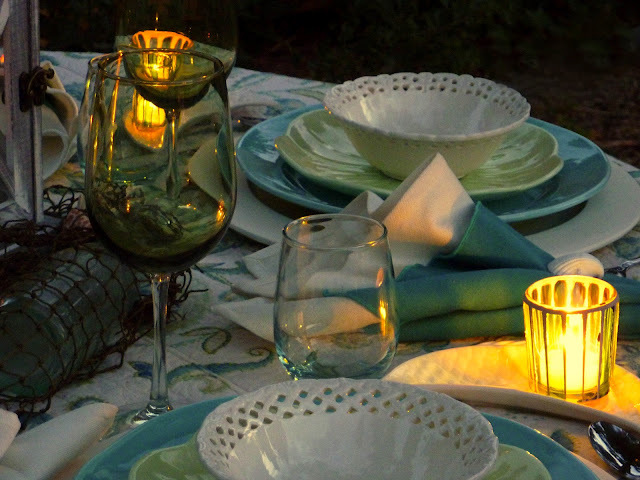 You really made the most of your budget and were able to set the mood with those shells in such a creative way. WOW is my response. Love everything about it. 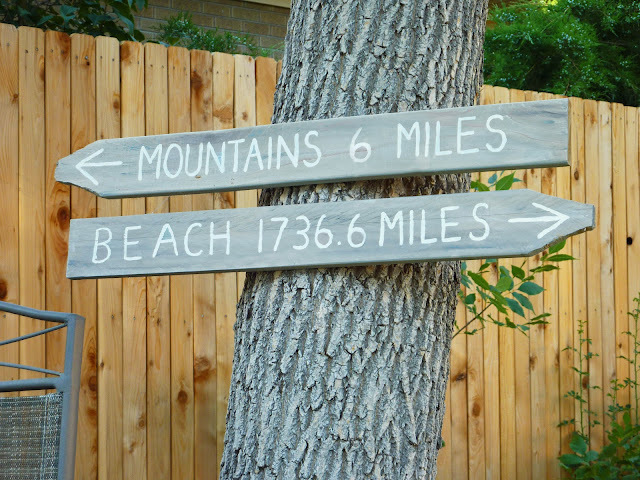 You nailed beachy even though you are 1736.6 miles from the beach. 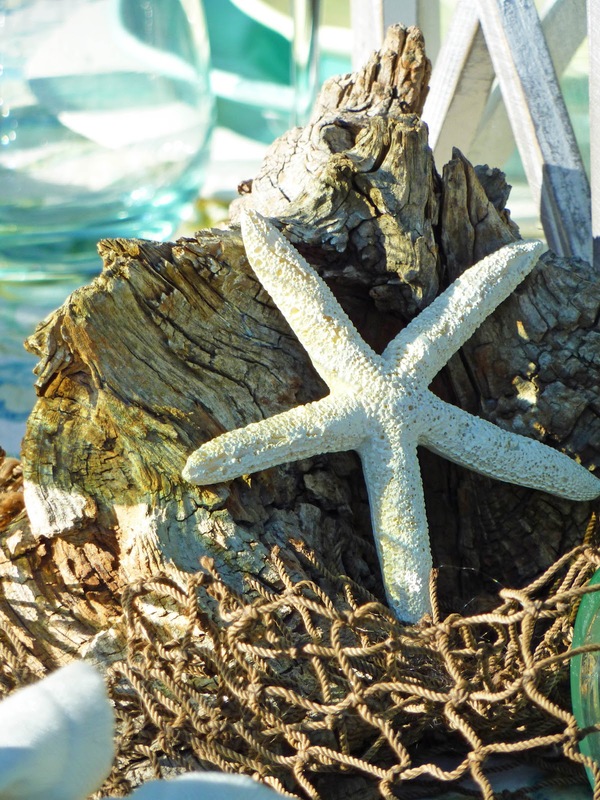 Love the aqua in your beach theme and all the beach elements you have added to the theme. Perfect. Perfect. The colors the textures the lantern and jars...all fabulous! Oh you really did good on the beach theme for it being a challenge for you. Love all your great ideas! 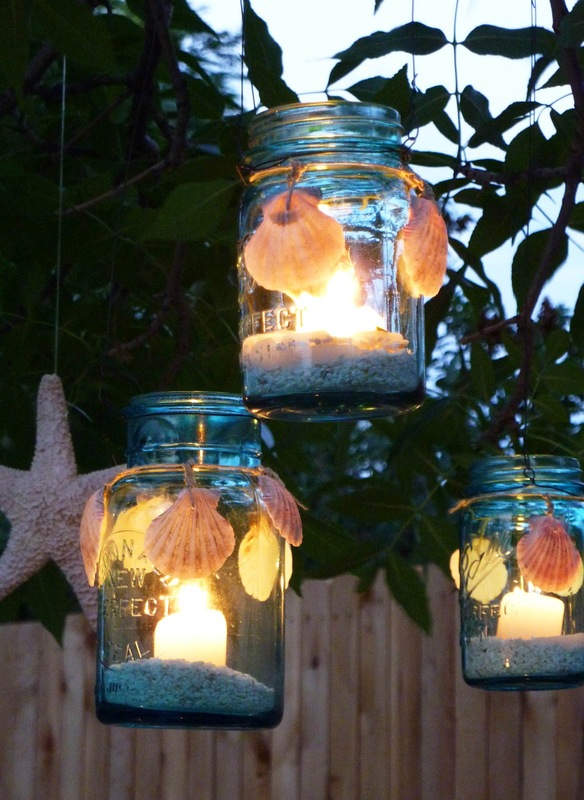 Those mason jars with the shells and candles are amazing! Love the outdoor setting. Well done!! Wow you did a fabulous job on this tablescape. Love to sit there under the candle light of those beautiful blue candle holders. I love it! You'd never know it was in Colorado and not at a beach house. 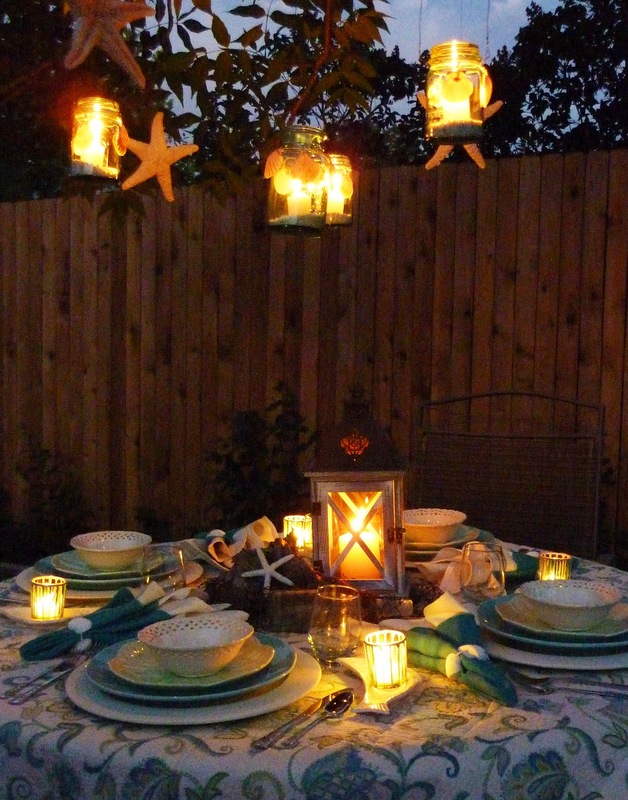 Love the Mason jar hanging lanterns. Clever idea. The whole thing is very pretty and creative. LOVE, love, love your mason jars/lanterns hanging and your "driftwood" centerpiece! I wish I had a basement to walk down to and find wonderful bottles & jars waiting for me! 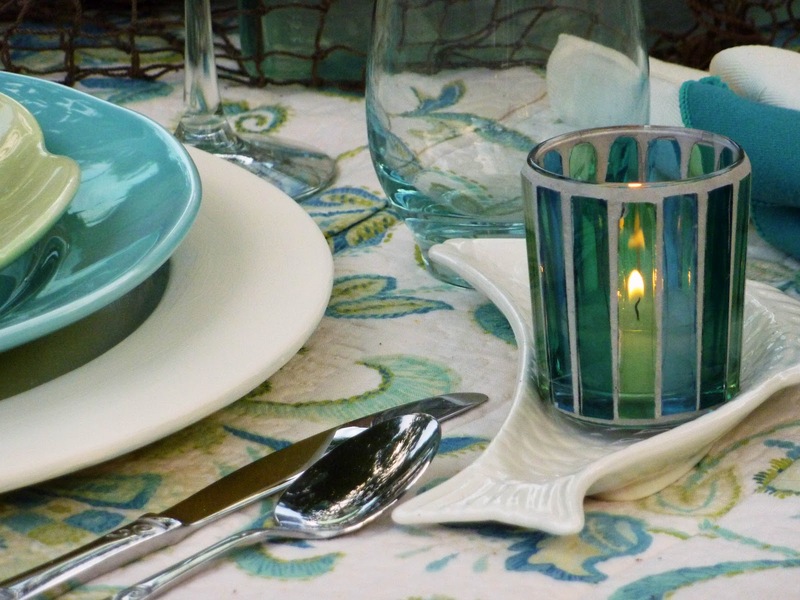 Your colors are wonderful on your table~ and perfect with your Michael's votives! 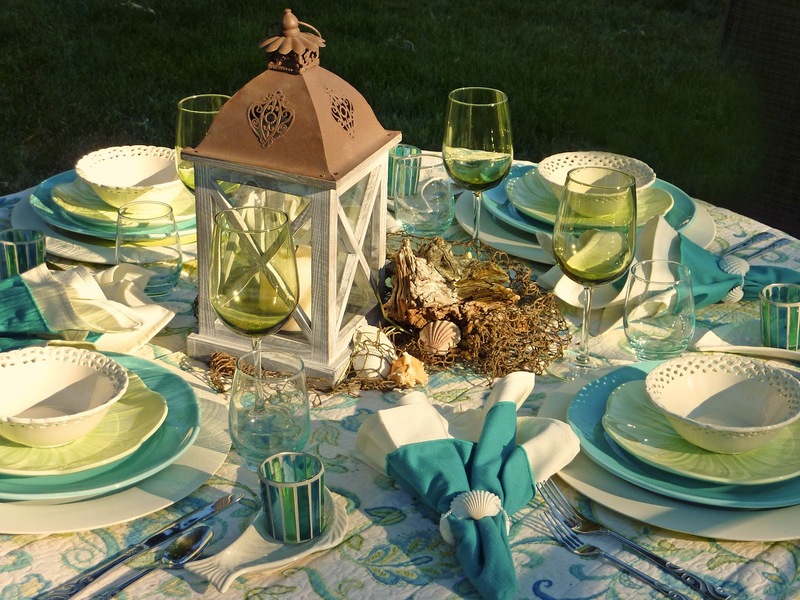 Elaine your sea inspired table is gorgeous!! 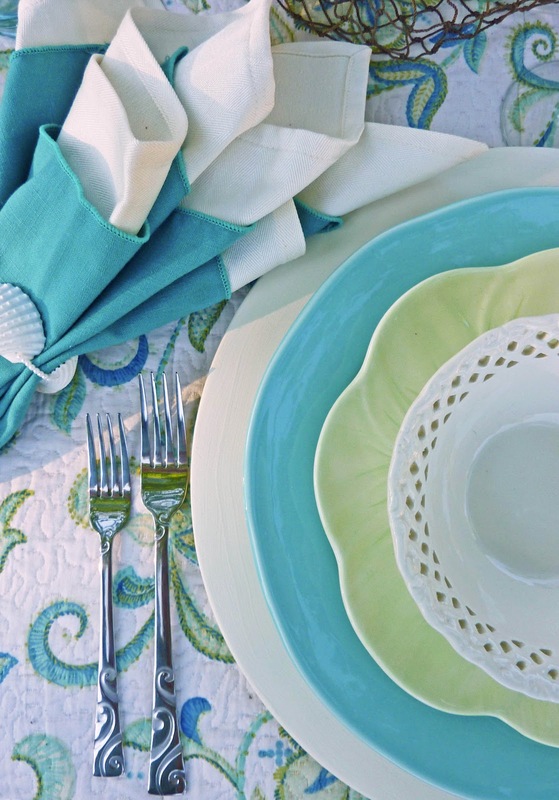 The quilt as a table cloth is perfect with all of the other details!! I need some wooden chargers as well! You KNOW you are wrong! You had us feeling sorry for you for a minute there, and then POW!!! You come up with this really great table with so many cool elements! You did a lot of work for this!!! One thing for sure: You'll definitely have everything you need for any future beach-themed dinner parties!!! FABULOUS job on the hanging lanterns and napkin rings! Bravo a million times over on both! Good eye on the design similarities re: the table covering and the flatware!!! Everything looks fantastic! Well done taking us all the way through sunset. I felt like I was right there. The signs you made are so fun and the starfish hanging from the trees was a creative touch. The whole mood was really lovely. How cool that you found that bottle too. The way it's caught up in the net really sets it off. Found your post at Ivy and Elephants. Stop over and see me at Quirky Vistas sometime. This is really beautiful! I love the soft blues and greens, but especially the decorated Mason jars you hung. That is such a creative way to use something many of us already have. 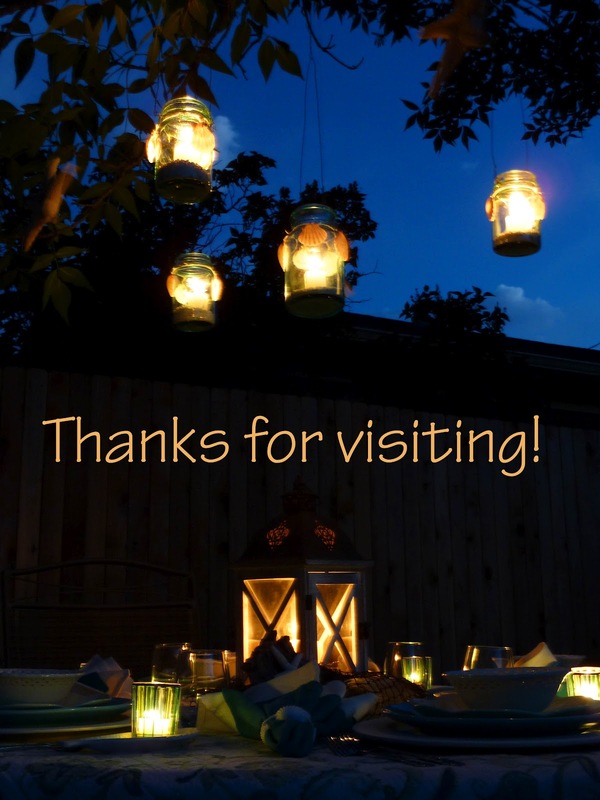 Thanks for sharing your table and your crafty ideas at the Grill, BBQ, & Picnic Party! What a gorgeous well detailed tablescape. I love all the soft sea colors!!! Your lanterns are adorable. Just beautiful! So much for not having anything Beachy! Your creativity really shines through with this table. The color of the mason jars and having them hung like that really makes the tablescape. I can't believe you made those napkin rings. Where did you get the patience. Are you sure we are sisters? This is absolutely beautiful! I love everything about it! The colors are just awesome and I love the night pics!! You live in Colorado? OMGosh, I thought we were at a beach house! Everything about your table is gorgeous. Love your creativity and eye for color and detail. Darling napkin rings and cute sign, too. I'm happy to be your newest follower. Did you say you had those gorgeous blue mason jars in your basement??? What other treasures do you have there? Gorgeous table and those napkins rings are stunning. So clever to drill holes in the shells and add pearls. Lovely colors and the twilight photos are beautiful. Love love love all the colors and details of your sea scape! 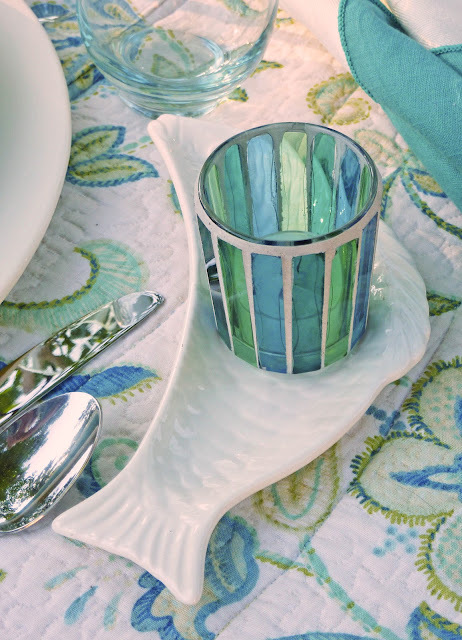 I am totally going to attach sea shells around my votive candle holders! All your dishes are to die for! Just beautiful! 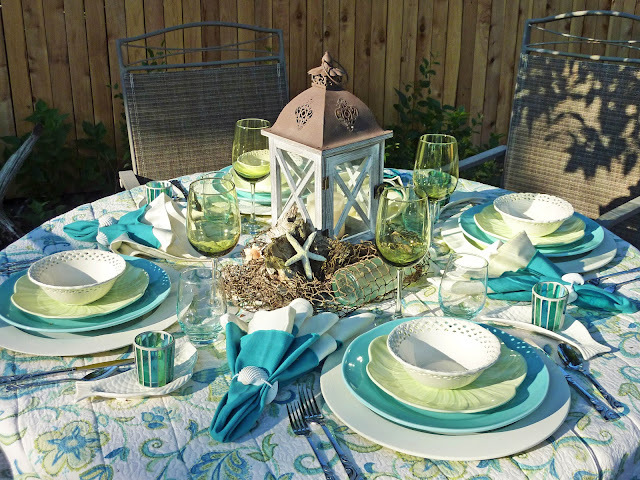 Come link up to centerpiece Wednesday on my blog and share your ideas with us! Wow! With this beautiful setting you'd have had a hard time convincing me that you didn't live close to the beach! I love this and the beach is my favorite place to vacation. You did a great job and I love it! Well, In know I am early visiting this post but, it is so wonderful! 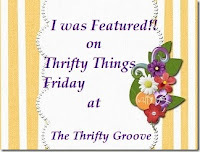 You did a great job creating a fabulous beachy party theme! Way to go. I love every element you added. thank you (in advanace) for joining TTF this week and I hope you have a wonderufl week! Amazing! You really pulled off this challenge! I would never be able to do a mountain table, as well as you did a beach one! The DYI Mason jars are perfect and your centerpiece is definitely "beachy". Beautiful job - so inspiring! 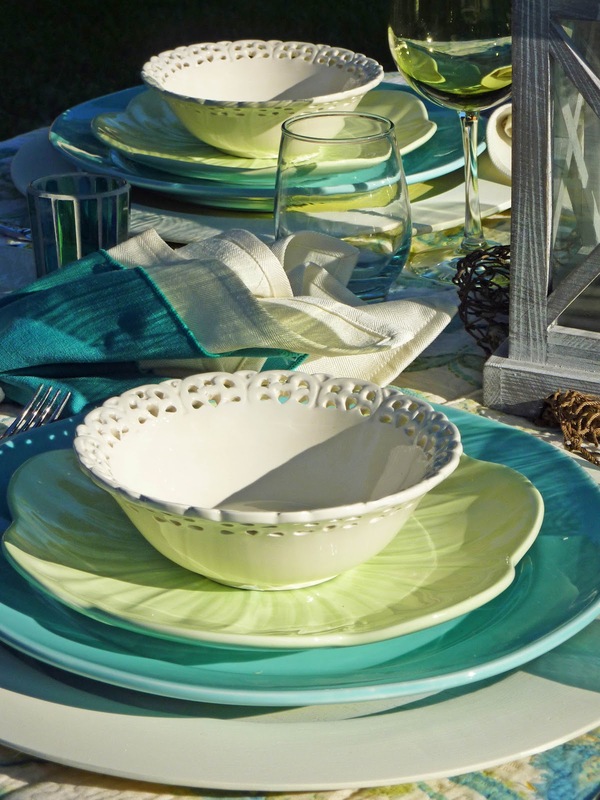 I would be delighted to be sitting at your beautiful table...I just love aqua and lime together. What a gorgeous quilt. This is absolutely beautiful!! I really covet your blue jars. This is the most beautiful table! You used your imagination and creativity and came up with any thing better than you could have just gone out and bought. Maybe you should market the napkin rings and jars? Your tablescape is gorgeous. I love the signs and the hanging candles. Beautiful tablescape!! Love the aqua color and the cute lanterns. 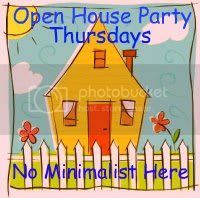 Thanks for linking to the Open House Party this week. Totally beautiful setting! The colors are magical and really do conjure up the sea. Your hanging Mason jars are stunning. 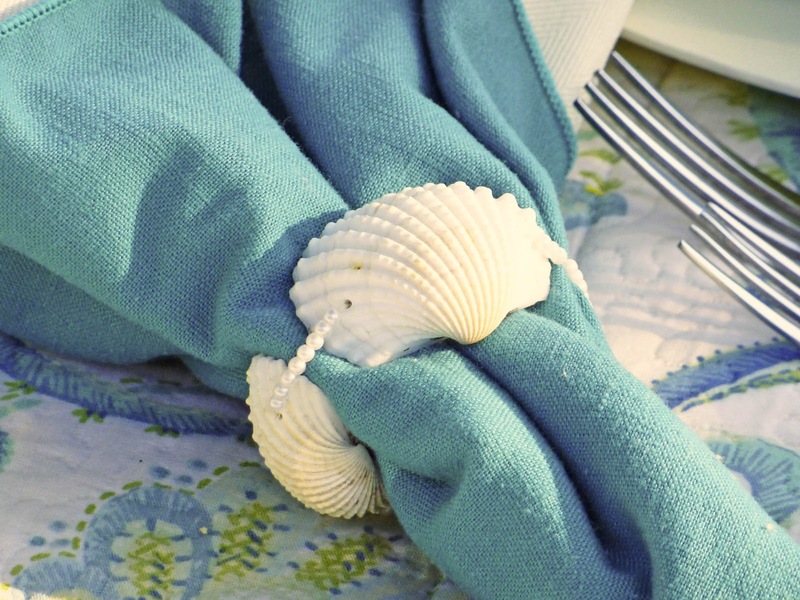 I love the shells decorating them and the napkin rings you created. This is a gorgeous, well done table setting with fabulous atmosphere! WOW! I wish you could come and help me decorate! I'm in Florida...not quite so far from the beach. 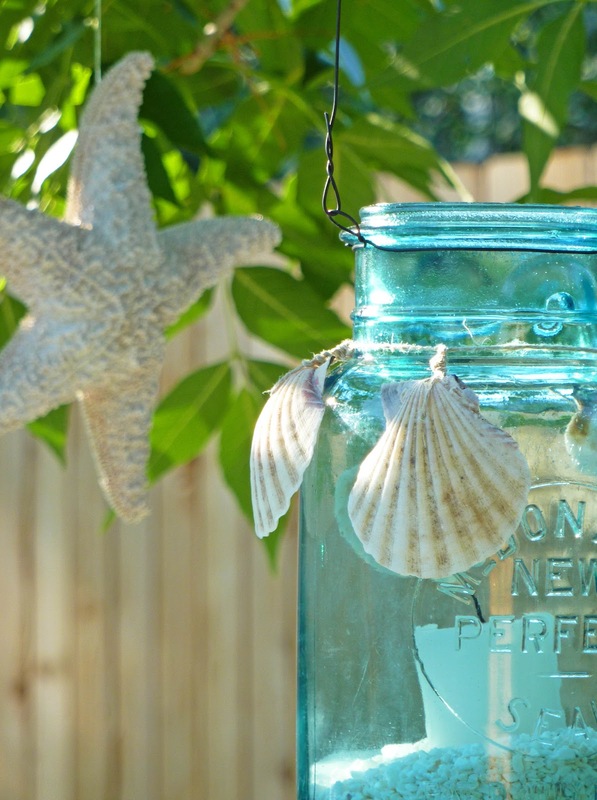 You really found a perfect way to bring summertime to your home! You would think this was Nantucket! You choice if colors and imagery is spot on. 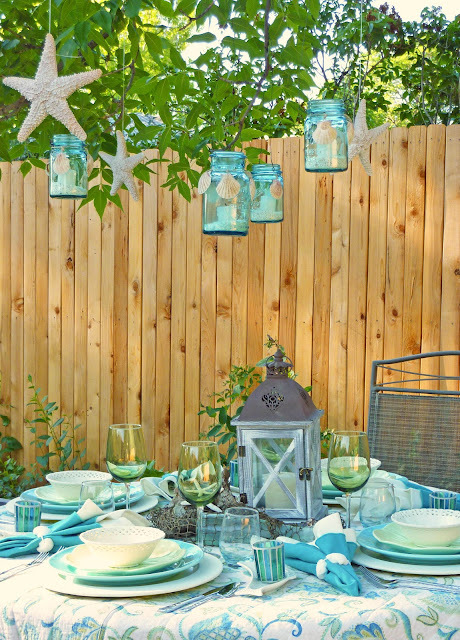 You photography for this shoot is just summertime gorgeous and the little ball jar lanterns add a nice touch to the tablescape. This is the prettiest table I have seen in a long time!! Would love to be sitting there - 2nd best to sitting on the beach. Your attention to detail really shines! Well done! 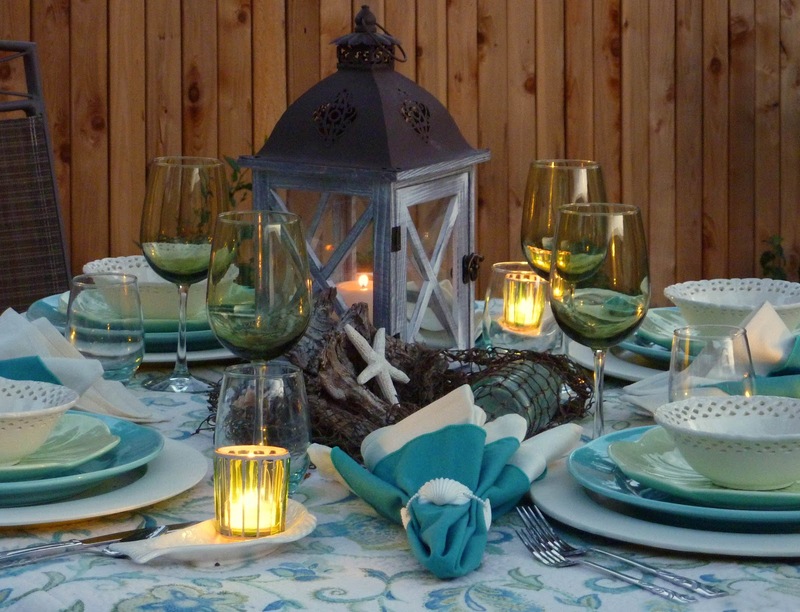 Elaine, your table and setting is absolutely magical!! I'm in awe at what you created. You sure fooled me as it looks like you're at the beach. 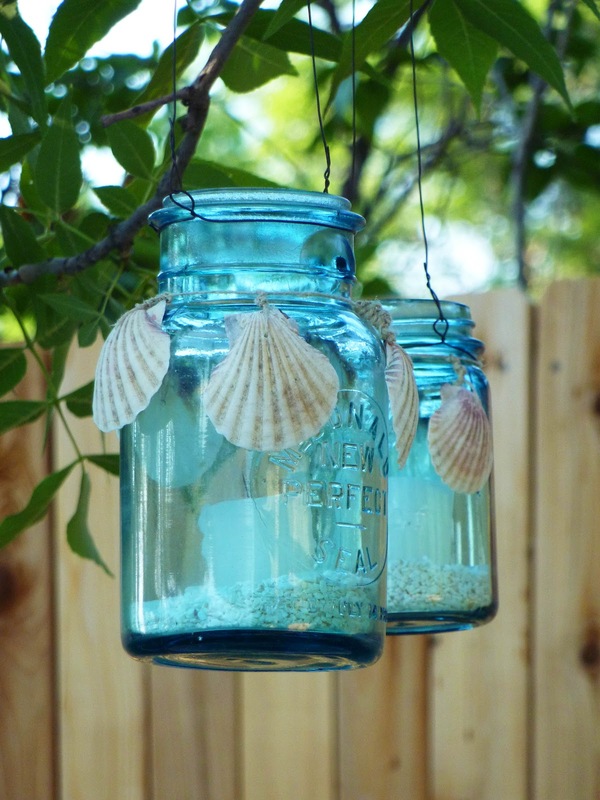 I don't know what I love the most, but the things that I adore are the hanging blue mason jars....love, love, love!!!!! i just love your tablescape! the way the flatware and the quilt tie in together is neat. i have those blue mason jars filled with sand, but, i think i will try the scallop shells strung around them like you did. also your photographs are really great! just beautiful! This is so creative! You really went all out and on a budget too! Love the hanging lanterns , signs and napkin rings you made. The table is mile high good! The colors are wonderful! Elaine, thanks for visiting so many of the Let's Dish entries. You are a good blogger! Very beautiful and so is stunning. 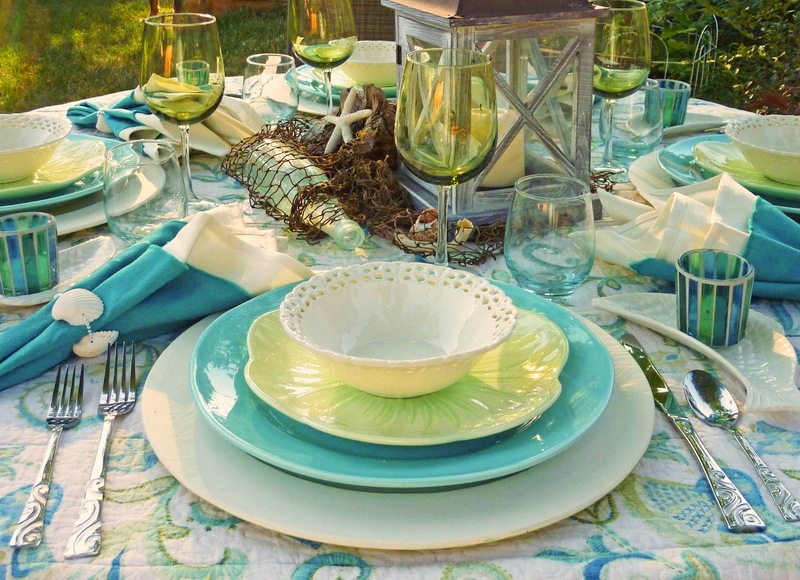 The colors and the seashells, everything looks so classic chic! You've got an A+++ on this project as this is the most outstanding tablescape I've seen far on your blog. Great job! I'd say you've definitely moved on from the minor league in tablescaping. Yours looks totally beautiful and very charming. I really like your hanging lanterns, & that quilt you are using for a tablecloth is beautiful! Great job! Hi Elaine! Gosh, your table (and everything related to it) are just wonderful! I could spend hours looking at your blog and the pretty things in it. 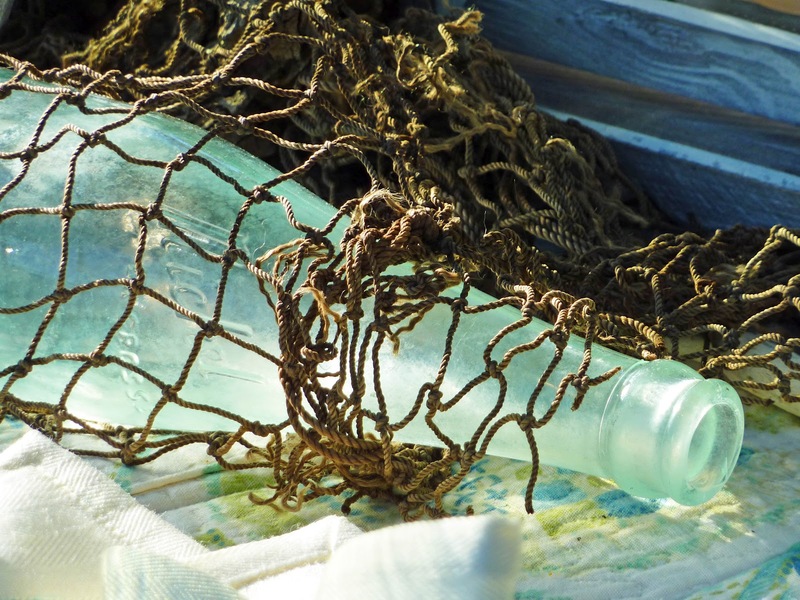 Some of my favorite items in your great photos are the blue jars and the bottle on the table...I wondered how someone "finds" those in a basement and then I read your other blog about "collecting". I am so in your same boat about wanting to keep bubble wrap, boxes, things for "someday". My husband (second for me too)says that the attic is going to collapse on us one day from all the stuff I have put up there . I found your blog via "Elephants and Ivy". This is just stunning! Your photos are incredible and I love the evening shots. I live in the mountains too and long for the beach so your sign just cracked me up. I've got this pinned and hope I'll be able to recreate a bit of your magic! Ah, your craftiness has brought the beach 1736.6 miles to you! This is so blue-tiful! Happy 1st Blue Monday, Elaine. My, this is beautiful. I love the hanging jars. hi i am from crystal grandeur.just fell in love with your beach scape.the table looks great. Everything is so pretty! Love the lanterns. Thank you for joining me at Home Sweet Home! What a great job you did! It all looks really coastal to me, but here in Kansas we have to get creative too...I love scattering shells and things around and pretending that I live near the sea! Thanks for sharing with us!